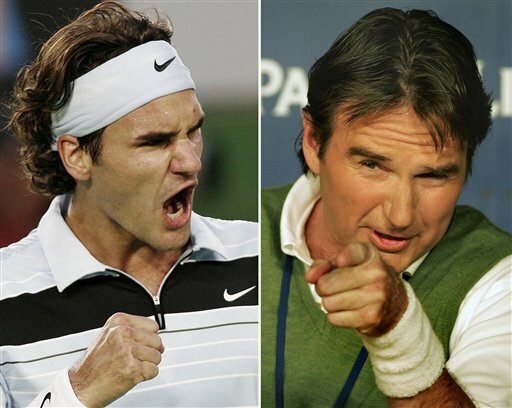 Roger Federer tied Jimmy Connors' record of 160 consecutive weeks as the top-ranked player in men's tennis Monday. The 10-time Grand Slam champion has held the No. 1 ATP Tour ranking since Feb. 2, 2004. The Swiss star is assured of breaking the record next week. "Breaking records and doing something that hasn't been done for a long time, it's really nice," Federer said recently. Connors was No. 1 from July 1974 to August 1977. He is now coaching one of Federer's biggest rivals, Andy Roddick. Federer, who has won six of the last seven Grand Slam titles, hasn't played since beating Fernando Gonzalez in the Australian Open final on Jan. 28. He returns to action next week at the Dubai Open. Federer has 8,120 points in the year-based rankings. Rafael Nadal, the man who beat Federer at the French Open last year, is second with 4,705 points. Nadal also beat Federer in the Dubai Open final last year. The 25-year-old Federer has dominated tennis for the past three seasons, but is still trying to win a Grand Slam title on clay. "That's the only way I can make this season a better one than last year," Federer has said. "Otherwise it won't be possible." Last season, only Nadal and Andy Murray managed to beat Federer, who finished the season with 12 titles and 16 finals appearances in his 17 tournaments. He earned $8.34 million and also won the season-ending Masters Cup. Federer couldn't be reached for comment Monday, but his mother was happy to hear that her son reached yet another milestone. "Of course I'm proud. It's super that my son has been No. 1 for three years," Lynette Federer said. Connors won eight Grand Slam titles in his career, which lasted more than 20 years. Although he also only failed to win the French Open, Connors did win the 1976 U.S. Open on clay. The American is the only man to win the U.S. Open on all three surfaces _ grass, clay and hardcourt. The ATP rankings began on Aug. 23, 1973. Associated Press writer Eliane Engeler in Geneva contributed to this report.